Jordan Clarkson had 14 points, seven assists and five rebounds against the Bulldogs. COLUMBIA, Mo. — Keanau Post made a long-awaited first trip to the podium. After threatening his season total with 14 points and also setting a career best in rebounds, the Missouri big man was at a loss for words. "He feels a lot more comfortable out there than he does right now," coach Frank Haith said after Missouri whipped Mississippi State 85-66 on Saturday. The 6-foot-11 Post was one of the top junior college players in the nation last season at Southwestern Illinois Community College, averaging 12 points and eight rebounds. During a rout that helped the Tigers move past losses at Alabama and Georgia, he was a standout again. "We all anticipate Keanau being just a really big-time player for us," Haith said. "I’m proud of Keanau, he’s kept working, he’s kept a positive attitude, and we’ve kept coaching him." Post had 14 points on 6-for-6 shooting and seven rebounds in 22 minutes, benefiting from extended playing time due to foul trouble on Johnathan Williams III and Ryan Rosburg. He totaled 18 points all season prior to Saturday and averaged 0.8 points and 1.3 rebounds. "It felt great," Post said. "I think it just felt great knowing that the whole team contributed to it. It wasn’t just me, it was the guards, for sure." 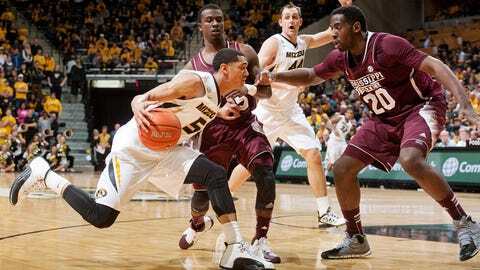 Jabari Brown scored 21 points and Missouri (20-9, 8-8 SEC) set season bests with 62 percent shooting and 19 assists. Jordan Clarkson had 14 points, seven assists and five rebounds. "That’s when it’s fun, when everybody has a hand in us winning," Haith said. "And everybody truly had a hand in us winning." The school is 14-2 at home and reached 20 victories for the sixth straight season, dominating against an opponent that entered with an RPI of 223. Inside men Post, Rosburg and Torren Jones finished off many of the assists, combining to make all 13 shots. Williams, Rosburg and Jones had two blocks apiece. "I think first and foremost, those guys had some easy opportunities because of the penetration by the Missouri guards," Ray said. "I think there was actually like two legitimate post moves by those guys in the paint." Missouri shot just 32 percent its last time out, losing by 15 at Georgia. "This is March now and we don’t want to lose any games in March," Brown said. "March is our money time and we’re trying to make the most of it." Fred Thomas matched his season best with 18 points for Mississippi State (13-16, 3-13), which has lost 11 in a row — eight of them by double digits. The Bulldogs had a season-best 10 3-pointers, four by Thomas and three by Jacoby Davis. "I’d be worried if our guys weren’t come to practice every day and working hard and competing," Ray said. "I know everybody focuses in on the losing streak, but you’ve got to make sure your team is still coming out and working and being enthusiastic." Brown had five points and Missouri had a pair of 3-pointers in a 15-0 run that put the game away at 68-41 with 11:12 to go. Mississippi State went almost 6 minutes without scoring before Davis’ 3-pointer near the mid-point of the second half. Clarkson went end-to-end twice, getting a layup and dunk, during an 11-2 run that gave Missouri its largest lead of the first half at 39-26 with 3:59 to go. Post’s tip-in at the buzzer, allowed after video review, put the Tigers up 45-32 at the break. Mississippi State played without leading scorer Craig Sword, who attended his grandmother’s funeral in Alabama. Sword averages 13 points. Gavin Ware added 13 points for the losers.